For anybody planning on a retirement, whether that’s Early Retirement Extreme, Early Retirement or a Typical Retirement not dependent on the whim of Government, based on a passive income stream generated provided by a portfolio which includes assets such as Equities and Bonds, then the amount of assets you need to accrue before pushing the retirement (financial independence) button is possibly the most important number that will be ever considered in your lifetime. wants to maintain the same standard of living throughout retirement so will increase his Gross Earnings in line with inflation every year. The actual calculation of the Retirement Number (how big a portfolio is required to retire) is actually very trivial and depends on only two numbers. It’s getting those two numbers that is the difficult bit and where all the risk is. The first number is what Gross Earnings do you want in retirement and the second number is what Initial Withdrawal Rate do you intend to start with. The maths is simply Retirement Number = Gross Earnings / Initial Withdrawal Rate. Let’s look at both of those numbers in detail. What Gross Earnings do you want in retirement? You’re hopefully tax efficiently invested in wrappers like ISA’s meaning you need a lower Gross Earnings than Gross Salary to give the same amount of money in your hand each month. You possibly own your home by now meaning you won’t be making those current mortgage payments. I calculated my retirement Gross Earnings back when I was in my mid thirties and first started on my journey towards financial independence. Every year I have then up rated this amount by inflation to ensure my standard of living will be maintained as the pound is devalued. When I hit retirement I intend to continue with this strategy. On Retirement Investing Today I never reveal my Gross Earnings target because it’s just irrelevant. Everybody has different needs, wants, risk tolerance and portfolio type meaning we all have a different Gross Earnings requirement. To enable us to run an example let’s assume that our Average Joe requires Gross Earnings of £25,000 when measured in today’s £’s. What Initial Withdrawal Rate do you intend to start with in retirement? The Initial Withdrawal Rate is critical. Take too much risk and you could deplete your portfolio within your lifetime. Taking too little may result in you working far longer than you need to and thus ending up with savings left at the end of your life (which might actually be part of your strategy if you want to pass wealth on to friends, family or charity). A logical starting point for determining the Initial Withdrawal Rate is the Rule of Thumb commonly known as the 4% Rule or 4% Safe Withdrawal Rate (SWR). A quick Google will reveal that this Rule of Thumb crudely means that if in the first year of retirement you withdraw 4% of your portfolio, then yearly up rate your withdrawals (your Gross Earnings) by inflation, the end result will be that you won’t exhaust your portfolio in your lifetime. What this Rule of Thumb is actually based on is a famous paper written by William Bengen in 1994 entitled “Determining Withdrawal Rates Using Historical Data”. Briefly the actual conclusion was that for a person who is 60-65 years old and possesses a 50:50 Stock : Bond Allocation then the highest withdrawal rate in the first year (which can then be adjusted for inflation every year) will be about 4% if they want their portfolio to outlive them. One thing that I feel is forgotten about in the Personal Finance world when this Rule of Thumb is mentioned is that it doesn’t allow for portfolio expenses which must be also accounted for. So if our Average Joe was going to use this Rule of Thumb and his annual portfolio expenses were 0.36% like mine currently are then his Retirement Number would be £25,000 / (4%-0.36%) = £686,813. Invest in a 50:50 Stock:Bond portfolio of innovative products that have expenses like this and his Retirement Number could be £25,000 / (4%-1.59%) = £1,037,344 unless his chosen Active Fund Managers really can outperform the market. If our Average Joe is looking for a more detailed approach, which I hope he is given the importance of this number, then his next stop might by what has become known as the Trinity Study. This was a paper published in 1998 by Philip Cooley, Carl Hubbard and Daniel Walz entitled “Retirement Savings : Choosing a Withdrawal Rate That Is Sustainable”. The content of this paper has been subsequently updated and now includes datasets up to December 2009. It is by the same Authors and is entitled “Portfolio Success Rates : Where to Draw the Line”. For our Average Joe who intends to up rate his Gross Earnings by inflation every year then Table 2 (shown below) is critical. 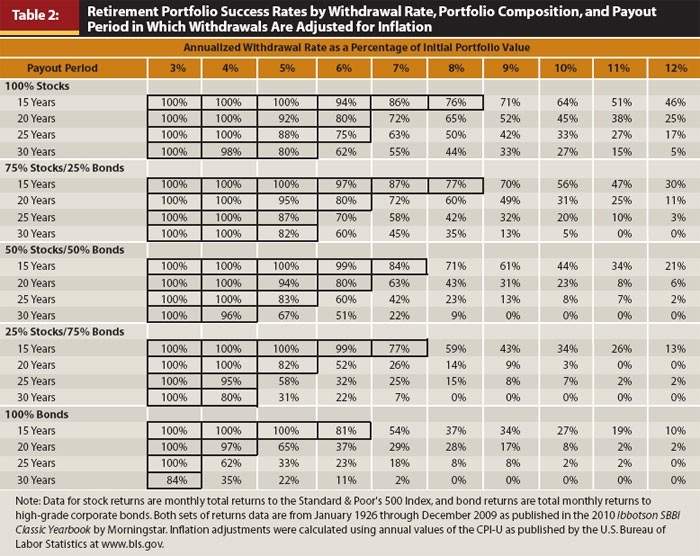 This Table enables Average Joe to choose an Asset Allocation, a Withdrawal Rate and a Payout period (how much longer does he intend to live). It then let’s him know what the probability of him exhausting his portfolio is. If after reading this paper he stayed with the Rule of Thumb of a 4% SWR, 50:50 Stocks : Bonds and decides he’ll live for another 30 years then he has a 96% chance of success. So Bengen’s approach looks sound (thus it still being a common rule of thumb) but does not “guarantee” (of course nothing is actually guaranteed because the past is not necessarily an indicator of the future) success. For that he needs to drop his SWR to 3% which means with expenses of 0.36% his Retirement Number could be £25,000 / (3%-0.36%) = £946,969. Start paying 1.59% for Active Funds that only give market returns and the numbers start getting scary at £25,000 / (3%-1.59%) = £1,773,049. That is 2.6 times the number our Average Joe needed under the Rule of Thumb Low Expenses example above. My Gross Earnings target was calculated a few years ago and was not calculated using the bare minimum I could live off but instead also included some fun money. As the years have gone by and I’ve also learnt the power of frugality then I’ve ended up in the situation where my Gross Earnings target is now more than I live off today. This combined with the fact that I believe I will maintain an interest in Personal Finance would mean that in times of Financial Armageddon (which I believe will happen many times over the next 50 or so years that I intend to live) I could hunker down and spend well less than my Gross Earnings. This would mean I wouldn’t be forced to sell capital when it’s devalued and instead could likely live off interest and dividends. While in my early days of retirement I expect to be very active I can see that as I become an “old” person I will spend far less than the Gross Earnings I’ve given myself. Have you used a similar method to calculate your Retirement Number or are you on a different journey? A timely post, sir. I'm in a position where I feel I'm largely on the right track with income and investments, but have no idea what that magic number is, and do feel I need that focus point. I'll have to re-read this post a couple of times to take it all in, but indubitably you just helped me take a big step in the right direction. Great work as usual, thanks. P.S. your site doesn't accept comments from Opera users. Glad the post has given you a steer and some ideas of where to go for further information. Re: Comments from Opera users. Thanks for the heads up. I'll do some research to see what I can do to maybe help but I fear it may be a problem with the Blogger platform that I use. Great article as usual RIT. You are, of course limited by the GAD rates (unless you are fortunate to qualify for flexible drawdown) - fortunately, the treasury have seen sense and will be putting the rate back up to 120% from end March, so 4 % shouldn't be a problem for even the under 60s. And yes, 4% is probably a good 'rule of thumb' for starters. The acid test will be the income you can sustainably generate from your pot and indeed, the equity:bond mix of your portfolio. As you say, it is important to keep an eye on charges - another factor is the annual drawdown admin charges which can impact on smaller pots. Thanks for highlighting the GAD rate issue. It didn't even come into my mind when posting as only about 40% of my portfolio is locked up in a Pension. Of course if I stop working when I Retire Early then that Pension % will creep up as I burn down non-Pension assets before being able to access the Pension. I have read a great deal on this subject and your write up sums it up nicely. I am aiming to use a 75/25 stock:bond split and have about ten years to go. My portfolio consists of index funds and an HYP split roughly 80% UK 10% ex.UK and 10% bonds. I am steadily moving towards the 75/25 split and increasing my ex.UK and bond allocation. I think I will use the divis from the HYP as the 'fun' money and the index funds as the essential spending, that's the idea anyway ! My withdrawal rate is 3.5% which allows for charges and a small safety margin. I use index funds from Vanguard, Fidelity and HSBC. All of this is over and above my workplace pensions which will come later as I want to retire at 50. It's doable but there are so many variables in life, so much can happen to economies in ten years and it all depends on the return. Nice to see somebody else corroborating my research. You sound a little more bullish than me. I'll likely end up at abot 60:40 but have a few years to figure that out yet. Interesting observation. Thanks for sharing. Just in case my post wasn't clear please note that this post was aimed at a withdrawal rate from multiple locations (ISA's, Pension's, NS&I ILSC's and non-tax efficient locations such as trading accounts) and not just from a Pension. I have just spent about two hours or more reading your blog, and I commend you for such an eloquent and easy to understand way of explaining what most people have a great deal of trouble planning. When I first read that your goal was a saving (or investing) rate of 60% of gross income, I thought you were bordering on insane. I did not understand the context under which you had made those plans, but now I do. I had retired nearly 15 years ago, but that was on the basis that assets were twenty times personal annual spending, and returns were in excess of 5% per year. However, I was living in a very low cost country. We moved to the UK to educate our two sons, and our cost of living quadrupled overnight. I had to go back and rethink retirement. I think we are about 80% there, but the kids are still in full time education so that is a big drain on the plan. About two years ago, I wanted to remove the effects of inflation from my calculations, because although I use a scary figure of 6% per year in my long term estimates, I have a gut feeling that it may turn out to be less. 6% is the average inflation of a basket of goods that WE consume, over the past 50 years, 25 years and 10 years, within half a percent. So I thought of our monthly outgoings (mandatory, discretionary, charitable and investment contributions) as one LUMP. Then I valued our investment assets in terms of gross lumps (gross assets) debt lumps (mortgages) and net lumps (equity), arriving at the conclusion that we needed 300 lumps of net equity to be in perpetual retirement. 300 lumps is 300/12 or 25 years at a drawdown rate of 4%. Ideally, we would need 400 lumps for a 3% drawdown, but it is not likely we will reach 400 lumps by the time we wish to retire. Just thought I would add that LUMP concept to the mix. It may be useful not to have to do all those compound interest calculations all the time. I would expect a LUMP of property to maintain its relative LUMP value into the future as I would expect a kilo of gold to do the same. However, I expect a LUMP of cash to be worth 94% of its value today by the time next year comes around, so for that, cash is pretty scary, and cash on deposit is guaranteed to lose 3% per year or thereabouts without any thought or work in the equation. I'm relatively new to the investment side of things and learning slowly! I have been working towards a retiring early fund and have been reading through this post with interest!